North Sulawesi (Indonesian: ) is a province of Indonesia. It is located on the northern tip of the island of Sulawesi, on the Minahasa Peninsula. The provinces capital and largest city is Manado, and its population was 2,270,596 according to the 2010 census; the latest official estimate (for January 2014) is 2,382,941. Motto: "Si Tou Timou Tumou Tou" (Minahasan), translated in English: "Human purpose in life is to nurture and educate others". 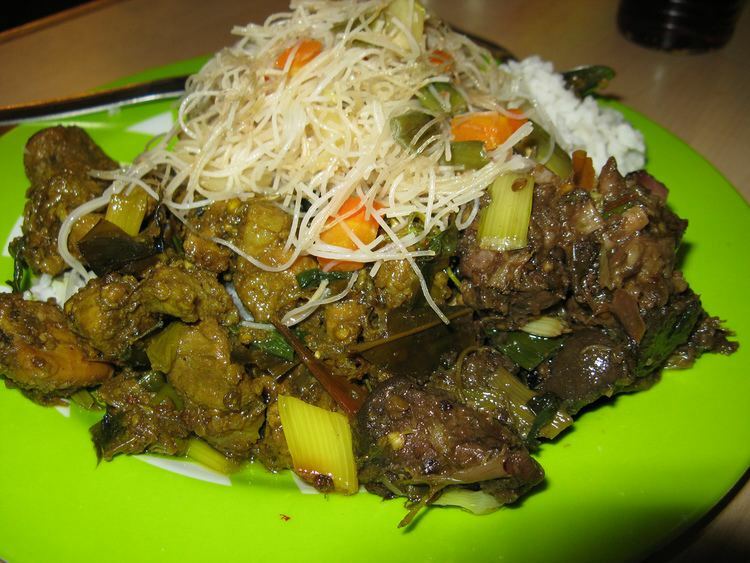 Manado cuisine or Minahasan cuisine is the cooking tradition of Minahasan people of North Sulawesi, Indonesia. It is popularly known as "Manado cuisine" after Manado city, the capital of the province, although other cities in North Sulawesi, such as Bitung, Tomohon and Tondano are also known as Minahasan culinary hotspots. Manado cuisine is known for its rich variations seafood, daring amount of spices, extra hot condiment, exotic meats, and European-influenced cakes and pastries. Manado food hallmark among others are; tinutuan (Manado style vegetables and rice congee), cakalang fufu (smoked skipjack tuna), cakalang noodle, paniki (spiced fruit bat), chicken or various fish/seafood spiced in rica-rica or woku spices, chicken tuturuga, and brenebon. Although not as popular and widely distributed as Padang food and Sundanese cuisine, today Manado cuisine has gained popularity in Indonesian cuisine scene. Numbers of Manado restaurants has been established in Indonesian cities, such as Jakarta, Bandung, Medan, Surabaya and Makassar. Manado cuisines are marked by mixture of native and foreign influences. Native Minahasan cooking tradition rely heavily on seafood as well as exotic bushmeats, and also their preference on freshly chopped hot spices. Yet sometimes they also demonstrates Chinese and European influences (especially Portuguese and Dutch), most prominent in their soup, cake and pastry delicacies. Chicken and beef are commonly consumed. Yet, unlike most of Indonesians, Minahasans are Christians, they did not share the halal dietary law like their Muslim neighbours do; the Gorontalos and Northern Maluku people. Subsequently pork, wild boar, and even exotic meats such as dog meat and bat are normally consumed.